Eichendorff's birthplace, Lubowitz Castle, Ratibor (photo from 1939). It was destroyed in March 1945 during the Upper Silesian Offensive. The territory was awarded to Poland after World War II. The remains of Lubowitz Castle, Racibórz (Poland), 2008. Note Eichendorff's portrait on the wall. The German inscription translates to "No poet has ever let go of his homeland", a quote from his novel Dichter und ihre Gesellen. Joseph Freiherr von Eichendorff (10 March 1788 – 26 November 1857) was a Prussian poet, novelist, playwright, literary critic, translator, and anthologist. 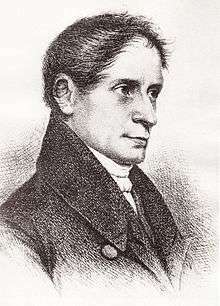 Eichendorff was one of the major writers and critics of Romanticism. Ever since their publication and up to the present day, some of his works have been very popular in Germany. 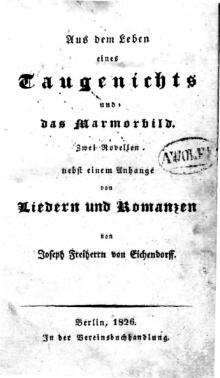 Eichendorff first became famous for his 1826 novella Memoirs of a Good-for-Nothing (German: Aus dem Leben eines Taugenichts) and his poems. The Memoirs of a Good-for-Nothing is a typical Romantic novella whose main themes are wanderlust and love. The protagonist, the son of a miller, rejects his father's trade and becomes a gardener at a Viennese palace where he subsequently falls in love with the local duke's daughter. As, with his lowly status, she is unattainable for him, he escapes to Italy - only to return and learn that she is the duke's adopted daughter, and thus within his social reach. With its combination of dream world and realism, Memoirs of a Good-for-Nothing is considered to be a high point of Romantic fiction. One critic stated that Eichendorff’s Good-for-Nothing is the "personification of love of nature and an obsession with hiking." Thomas Mann called Eichendorff's Good-for-Nothing a combination of "the purity of the folk song and the fairy tale." Many of Eichendorff's poems were first published as integral parts of his novellas and stories, where they are often performed in song by one of the protagonists. The novella Good-for-Nothing alone contains 54 poems. 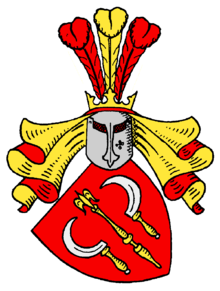 Eichendorff, a descendant of an old noble family, was born in 1788 at Schloß Lubowitz near Ratibor (now Racibórz, Poland) in Upper Silesia, at that time part of the Kingdom of Prussia. His parents were the Prussian officer Adolf Freiherr von Eichendorff (1756-1818) and his wife, Karoline née Freiin von Kloche (1766-1822), who came from an aristocratic Roman Catholic family. Eichendorff sold the family estates Deutsch-Krawarn, Kauthen, and Wrbkau and acquired Lubowitz Castle from his mother-in-law. The castle's Rococo reconstruction, which was begun by her, was very expensive and almost bankrupted the family. 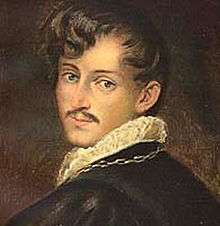 Young Joseph was close to his older brother Wilhelm (1786-1849). From 1793-1801 they were home-schooled by tutor Bernhard Heinke. Joseph began writing diaries as early as 1798, witnesses to his budding literary career. The diaries present many insights into the development of the young writer, ranging from simple statements about the weather to notes about finances to early poems. At a young age, Eichendorff was already well aware of his parents financial straits. On 19 June 1801, the thirteen-year old noted in his diary: "Father travelled to Breslau, on the run from his creditors," adding on 24 June, "mom become terribly faint." With his brother Wilhelm, Joseph attended the Catholic Matthias Gymnasium in Breslau (1801-1804). While previously preferring chapbooks, he was now introduced to the poetry of Matthias Claudius and Voltaire’s La Henriade, an epic poem about the last part of the wars of religion and Henry IV of France in ten songs. In 1804 his sister Luise Antonie Nepomucene Johanna was born (died 1883), who was to become a friend of Austrian writer Adalbert Stifter. After their final exams, both brothers attended lectures at the University of Breslau and the Protestant Maria-Magdalena-Gymnasium. Eichendorff's diary from this time shows that he valued formal education much less than the theatre, recording 126 plays and concerts visited. His love for Mozart also goes back to these days. Joseph himself seems to have been a talented actor and his brother Wilhelm a good singer and guitar player. Together with his brother Wilhelm, Joseph studied law and the humanities in Halle an der Saale (1805–1806), a city near Jena, which was a focal point of the Frühromantik (Early Romantics). The brothers frequently attended the theatre of Lauchstädt, 13 km where the Weimar court theatrical company performed plays by Goethe. In October 1806 Napoleon's troops took Halle and teaching at the university ceased. 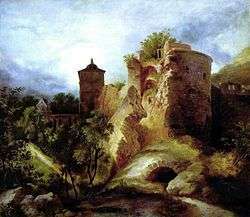 To complete their studies, Wilhelm and Joseph went to the University of Heidelberg in 1807, another important centre of Romanticism. Here Eichendorff befriended romantic poet Heinrich Otto von Loeben (1786-1825), met Achim von Arnim (1781-1831) and possibly Clemens Brentano (1778-1842). In Heidelberg, Eichendorff heard lectures by Joseph Görres, a leading member of the Heidelberg Romantic group, a "hermitic magician" and "formative impression", as Eichendorff later explained. In 1808 the brothers finished their degrees, after which they undertook an educational journey to Paris, Vienna, and Berlin. In Berlin they came into closer contact with Romantic writers such as Achim von Arnim, Clemens Brentano, Adam Müller, and Heinrich von Kleist. In order to further their professional prospects, they travelled to Vienna in 1810, where they concluded their studies with a state examination diploma. Wilhelm procured employment in the Austrian civil service, while Joseph went back home to help his father with managing the estate. 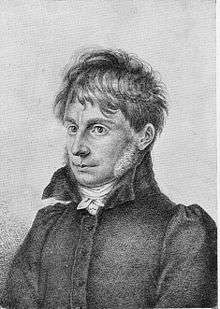 From Eichendorff’s diaries we know about his love for a girl, Amalie Schaffner, and another love affair in 1807-08 during his student days in Heidelberg with one Käthchen Förster. His deep sorrow about the unrequitted love for the nineteen-year-old daughter of a cellarman inspired Eichendorff to one of his most famous poems, Das zerbrochene Ringlein (The Broken Ring). When falls the dark of night. Although Chase’s translation weakens the second line from blut’ge Schlacht (bloody battle) to "in fight" this, actually, happens to be much closer to the historical truth, since Eichendorff’s participation in the Lützow Free Corps seems to be a myth - in spite of some authorities asserting the contrary. 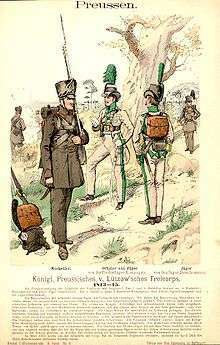 In 1813, when conflict flared up again, Eichendorff tried to join the struggle against Napoleon, however he lacked the funds to purchase a uniform, gun, or horse, and, when he finally managed to get the money necessary, the war was all but over. His parents, in order to save the indebted family estate, hoped that Eichendorff would marry a wealthy heiress, however he fell in love with Aloysia von Larisch (1792-1855), called ‚Luise’, the seventeen-year-old daughter of a prominent, yet impoverished Catholic family of nobles. The betrothal took place in 1809, the same year Eichendorff went to Berlin to take up a profession there. In 1815, the couple was married in Breslau's St. Vinzenz church and that same year Eichendorff’s son Hermann was born, followed in 1819 by their daughter Therese. In 1818, Eichendorff's father died and in 1822 his mother. 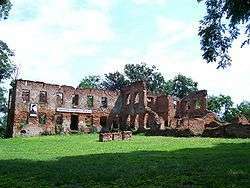 The death of his mother resulted in the final loss of all the family's estates in Silesia. Eichendorff worked in various capacities as Prussian government administrator. His career began in 1816 as unpaid clerk in Breslau. In November 1819, he was appointed assessor and in 1820 consistorial councilor for West and East Prussia in Danzig, with an initial annual salary of 1200 thalers. In April 1824, Eichendorff was relocated to Königsberg as "Oberpräsidialrat" (chief administrator) with an annual salary of 1600 thalers. In 1821, Eichendorff was appointed school inspector and, in 1824, "Oberpräsidialrat" in Königsberg. In 1831, he moved his family to Berlin, where he worked as Privy Councilor for the Foreign Ministry until his retirement in 1844. Eichendorff’s brother Wilhelm died in 1849 in Innsbruck. That same year, there was a Republican uprising and the Eichendorff’s fled to Meißen and Köthen, where a little house was purchased for his daughter Therese (now a von Besserer-Dahlfingen) in 1854. In 1855, he was much affected by the death of his wife. In September he traveled to Sedlnitz for the christening of his grandchild. Shortly after he made his very last trip, dying of pneumonia on 26 November 1857 in Neiße. He was buried the next day with his wife. The two writers who had the greatest early influence on Eichendorff's artistic development were Friedrich Schlegel, who established the term romantisch (romantic) in German literature, and Joseph Görres. While the writers who gathered around Schlegel inclined more to philosophy and aesthetic theory, the adherents of Görres became mainly known as writers of poetry and stories. 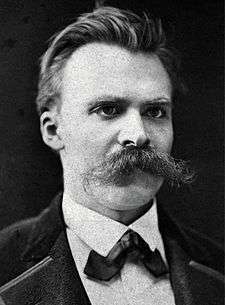 Both movements, however, greatly influenced intellectual life in Germany by emphasising the individual, the subjective, the irrational, the imaginative, the personal, the spontaneous, the emotional, the visionary, and the transcendental over classical precepts. One of their fundamental ideas was the "unity of poetry and life". Eichendorff shared Schlegel’s view that the world was a naturally and eternally "self-forming artwork", Eichendorff himself used the metaphor that "nature [was] a great picture book, which the good Lord has pitched for us outside." 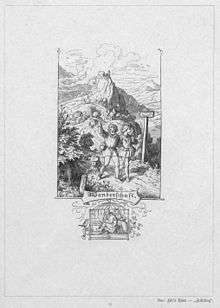 Arnim’s and Brentano’s studies and interpretations of the Volkslied (folk song) deeply influenced Eichendorff’s own poetry and poetology. 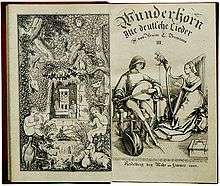 Arnim's and Brentano's anthology Des Knaben Wunderhorn: Alte deutsche Lieder, a collection of songs about love, soldiers, wandering, as well as children's songs, was an important source for the Romantic movement. 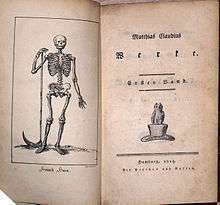 Similar to other early 19th-century anthologists such as Thomas Percy, Arnim and Brentano edited and rewrote the poems in they collected. "Everything in the world happens because of poetry, to live life with an increased sense and history is the expression of this general poetry of the human race, the fate performs this great spectacle," is what Arnim said in a letter to Brentano (9 July 1802). Although Eichendorffs poetry includes many metric forms ranging from very simple elegiac couplets and stanzas to sonnets, his main artistic focus was on poems imitating folk songs. A comparison of forms shows that Eichendorff’s lyricism is "directly influenced by Brentano and Arnim". Following the model of Des Knaben Wunderhorn, Eichendorff uses simple words ('naturalness'), adding more meaning ('artificiality') than dictionary definitions would indicate. In this sense, "His words are rich in connotative power, in imaginative appeal and in sound." Once you hit the magic tone. The titles of Eichendorff’s poems show that, besides the motif of wandering, the two other main motifs of his poetry were the passing of time (transience) and nostalgia. Time, for Eichendorff, is not just a natural phenomenon but, as Marcin Worbs elaborated: "Each day and each of our nights has a metaphysical dimension." The morning, on the other hand, evokes the impression that "all nature had been created just in this very moment," while the evening often acts as a mysterium mortis with the persona poderiung on transience and death. Eichendorff's other main motif, nostalgia, is described by some critic as a phenomenon of infinity. However, there is a number of different interpretations. According to Helmut Illbruck: The "simple-minded Taugenichts (...) feels continually homesick and can never come to rest." Katja Löhr distinguishes between nostalgia as an emotion consisting of two components — longing and melancholy: "The inner emotion of longing is to long for, the inner emotion of melancholy is to mourn. As an expression of deep reflection, longing corresponds with intuition (Ahnen), grieving with memory." Theodor W. Adorno, who set out to rescue Eichendorff from his misled conservative admirers, attested: "He was not a poet of the homeland, but rather a poet of homesickness". In sharp contrast, Natias Neutert saw in Eichendorff’s nostalgia a dialectical unity of an "unstable equilibrium of homesickness and wanderlust at once". For a long time it had been argued that Eichendorff's view of Romanticism had been subordinate to religious beliefs. More recently, however, Christoph Hollender has pointed that Eichendorff's late religious and political writings were commissioned works, while his poetry represents a highly personal perspective. Eichendorff summed up the Romantic epoch stating that it "soared like a magnificent rocket sparkling up into the sky, and after shortly and wonderfully lighting up the night, it exploded overhead into a thousand colorful stars." 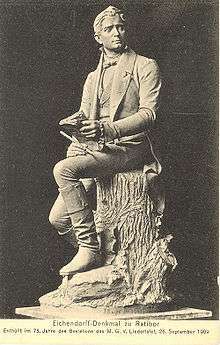 "While other authors (such as Ludwig Tieck, Caroline de la Motte Fouqué, Clemens Brentano and Bettina von Arnim) adapted the themes and styles of their writing to the emerging realism, Eichendorff "stayed true to the emblematic universe of his literary Romanticism right through to the 1850s,"  Adorno stated: "Unconsciously Eichendorff’s unleashed romanticism leads right up to the threshold of modernism". Die geistlichen Schauspiele Calderons (2 vol. ), (1846–53). 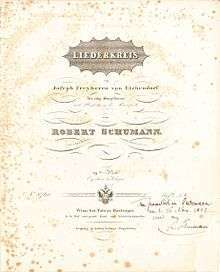 Geschichte der poetischen Literatur Deutschlands, (1857). Oberschlesische Märchen und Sagen (Upper Silesian fairytales and sagas, (1808–1810). Lebrecht Blücher Dreves: Gedichte. Ed. and with a foreword by Joseph v. Eichendorff. Verlag Duncker & Humblot, Berlin 1849. Eichendorff monument in Ratibor by Johannes Boese. Erected in 1909, it was removed in 1945 when the Soviets occupied Silesia and disappeared shortly thereafter. A replacement was put up in 1994. With approximately 5000 musical settings, Eichendorff is the most popular German poet set into music. "The magical, enchanting lyricism of his poetry almost seems to be music itself," as it is praised. 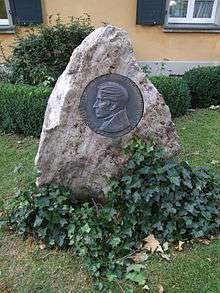 His poems have been set to music by many composers, including, Schumann, Mendelssohn, Johannes Brahms, Hugo Wolf, Richard Strauss, Hans Pfitzner, Hermann Zilcher, Alexander Zemlinsky, Max Reger, and even Friedrich Nietzsche. His poems also inspired orchestral music, such as Reger's Eine romantische Suite. Sämtliche Werke des Freiherrn Joseph von Eichendorff. Historisch-kritische Ausgabe : (shortened form: HKA). Begründet von Wilhelm Kosch und August Sauer, fortgeführt und herausgegeben von Hermann Kunisch (†) und Helmut Koopmann, Max Niemeyer Verlag, Tübingen. HKA I/1: Gedichte. Erster Teil. Text. Ed. by Harry Fröhlich/Ursula Regener (1993). HKA I/2: Gedichte. Erster Teil. Kommentar. Aufgrund von Vorarbeiten von Wolfgang Kron. Ed. by Harry Fröhlich (1994). HKA I/3: Gedichte. Zweiter Teil. Verstreute und nachgelassene Gedichte. Text. Ed. by Ursula Regener (1997). HKA I/4: Gedichte. Zweiter Teil. Verstreute und nachgelassene Gedichte. Kommentar. Ed. by Ursula Regener (1997). HKA III: Ahnung und Gegenwart. Ed. by Christiane Briegleb/Clemens Rauschenberg (1984). HKA IV: Dichter und ihre Gesellen. Ed. by Volkmar Stein (2001). HKA V/1: Erzählungen. Erster Teil. Text. Ed. by Karl Konrad Polheim (1998). HKA V/2: Erzählungen. Erster Teil. Kommentar. Ed. by Karl Konrad Polheim (2000). HKA V/3: Erzählungen. Zweiter Teil. Fragmente und Nachgelassenes. Ed. 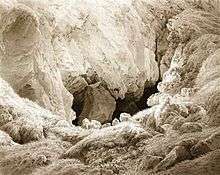 by Heinz-Peter Niewerth (2006). HKA V/4: Erzählungen. Dritter Teil. Autobiographische Fragmente. Ed. by Dietmar Kunisch (1998). HKA VI/1: Historische Dramen und Dramenfragmente. Text und Varianten. Ed. by Harry Fröhlich (1996). HKA VI/2: Historische Dramen und Dramenfragmente. Kommentar. Ed. by Klaus Köhnke (1997). HKA VIII/1: Literarhistorische Schriften I. Aufsätze zur Literatur. Aufgrund der Vorarbeiten von Franz Ranegger. Ed. by Wolfram Mauser (1962). HKA VIII/2: Literarhistorische Schriften II. Abhandlungen zur Literatur. Aufgrund der Vorarbeiten von Franz Ranegger. Ed. by Wolfram Mauser (1965). HKA IX: Literarhistorische Schriften III. Geschichte der poetischen Literatur Deutschlands. Ed. by Wolfram Mauser (1970). HKA XII: Briefe 1794–1857. Text. Ed. by Sibylle von Steinsdorff (1993). HKA XV/1: Übersetzungen I. Erster Teil. Graf Lucanor von Don Juan Manuel. Geistliche Schauspiele von Don Pedro Calderón la Barca I. Ed. by Harry Fröhlich (2003). HKA XV/2: Übersetzungen I. Zweiter Teil. Geistliche Schauspiele von Don Pedro Calderón la Barca II. Ed. by Harry Fröhlich (2002). HKA XVI: Übersetzungen II. Unvollendete Übersetzungen aus dem Spanischen. Ed. by Klaus Dahme (1966). HKA XVIII/1: Eichendorff im Urteil seiner Zeit I. Dokumente 1788–1843. Günter and Irmgard Niggl (1975). HKA XVIII/2: Eichendorff im Urteil seiner Zeit II. Dokumente 1843–1860. Ed. by Günter and Irmgard Niggl (1976). HKA XVIII/3: Eichendorff im Urteil seiner Zeit III. Kommentar und Register. Ed. by Günter and Irmgard Niggl (1986). HKA VII: Dramen II. Satirische Dramen und Dramenfragmente. Ed. by Harry Fröhlich. HKA XIII: Briefe an Eichendorff. Ed. by Sibylle von Steinsdorff. HKA XIV: Kommentar zu den Briefen (Bd. XII und Bd. XIII). Ed. by Sibylle von Steinsdorff. HKA XVII: Amtliche Schriften. Ed. by Hans Pörnbacher. Theodor W. Adorno: "Zum Gedächtnis Eichendorffs". In: Noten zur Literatur I. Bibliothek Suhrkamp 47, Frankfurt am Main 1963. pp. 105-143. Hans Brandenburg: Joseph von Eichendorff. Sein Leben und sein Werk. Beck, Munich 1922. Rufus Hallmark: German Lieder in the Nineteenth Century. Schirmer, New York 1996. ISBN 0-02-870845-8. Helmut Illbruck: Nostalgia. Origins and Ends of an Unenlightened Disease. Northwestern University Press, Evanston Illinois, 2012. ISBN 9780810128378. Hans Jürg Lüthi: Dichtung und Dichter bei Joseph von Eichendorff. Francke Verlag, Bern 1966. Sybille Anneliese Margot Reichert: Unendliche Sehnsucht. The Concept of Longing in German Romantic Narrative and Song. Dissertation, Yale University 1995. Oskar Seidlin: Versuche über Eichendorff. Vandenhoeck & Ruprecht, Göttingen 1965. Deutsches Eichendorff-Museum, Eselsberg 1, D-7988 Wangen im Allgäu, Germany, c/o Sybille Heimann, 07522 / 3840 or 3704. Frankfurter Goethe-Haus. Freies Deutsches Hochstift. Großer Hirschgraben 23-25, 60311 Frankfurt am Main. 1 2 Cf. J. A. Cuddon: The Penguin Dictionary of Literary Terms and Literary Theory, revised by C. E. Preston. London 1999, p. 770. ↑ Cf. Ernst Alker: Die deutsche Literatur im 19. 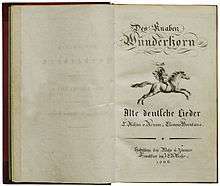 Jahrhundert (1832-1914), 2nd ed., Kröners Taschenbuch vol. 339, Stuttgart 1962, p. 27. ↑ Further reading: F. Maak: Das Goethetheater in Lauchstädt. D. Häcker, Lauchstädt 1905. ↑ Cf. Hans Jürg Lüthi: Dichtung und Dichter bei Joseph von Eichendorff. Francke Verlag, Bern 1966, pp. 68-71, 155 f.
↑ In: German Poetry from 1750 to 1900. Ed. by Robert M. Browning. The German Library, vol.39. The Continuum Publishing Company, New York 1984, p.146-147. ↑ Cf. Arthur E. Imhof: Lebenserwartungen in Deutschland vom 17. bis 19. Jahrhundert.. VCH Acta Humaniora. Weinheim 1990. ↑ Margarete Münsterberg (Ed., trans. ): A Harvest of German Verse. Berlin 1916. ↑ J. A. Cuddon: The Penguin Dictionary of Literary Terms & Literary Theory, revised by C. E. Preston. England 1999, p.768. ↑ J. A. Cuddon: The Penguin Dictionary of Literary Terms & Literary Theory, revised by C. E. Preston. England 1999, p.770. ↑ Cf. Robert König: Deutsche Literaturgeschichte. Bielefeld/Leipzig 1886, p.521. ↑ Quoting after Natias Neutert: Foolnotes. Smith Gallery Booklet, Soho New York 1980, p.7, see Friedrich Schlegel: Gespräch über die Poesie. In: Paul Kluckhohn (Ed. ): Kunstanschauung der Frühromantik. Deutsche Literatur, Reihe Romantik. Vol.III, Philipp Reclam jun., Leipzig, 1937, p.191. ↑ Cf. Horst Joachim Frank: Handbuch der deutschen Strophenformen. 2nd, revised ed., Tübingen/Basel 1993, p.107. ↑ Cf. Edward A. Bloom/Charles H. Philbrick/Elmer M. Blistein: The Order of Poetry. Brown University, New York 1961, p.2. ↑ Cf. Reinhard H. Thum: Cliché and Stereotype. An Examination of the Lyric Landscape in Eichendorff’s Poetry. In: Philological Quarterly no. 62, University of Iowa 1983, pp. 435-457. ↑ Cf. Joseph Görres: Gesammelte Schriften, ed. by Wilhelm Schellberg on behalf of the Görres-Gesellschaft, Köln 1926, vol.IV, p.2 and V, p.274. - Cf. also Gerhard Möbus: Eichendorff in Heidelberg. Wirkungen einer Begegnung. Diederichs Verlag, Düsseldorf 1954. ↑ Cf. Peter Paul Schwarz: Aurora. Zur romantischen Zeitstruktur bei Eichendorff. Ars poetica. Texte zur Dichtungslehre und Dichtkunst. Vol. 12, ed. by August Buck et al., Bad Homburg 1970, p.60. ↑ Cf. Marshall Brown: Eichendorff’s Time of day. In: «The German Quarterly», No.50, 1977, pp.485-503. ↑ Cf. Sybille Anneliese Margot Reichert: Unendliche Sehnsucht . The concept of Longing in German romantic Narrative and Song. Dissertation Yale University, Ann Arbor, Michigan, 1994. ↑ Cf. Helmut Illbruck: Nostalgia. Origins and Ends of an Unenlightened Disease, Evanston Illinois, p.153. ISBN 9780810128378. ↑ Cf. Theodor. W. Adorno: Zum Gedächtnis Eichendorffs. In: Noten zur Literatur I, Frankfurt am Main, 1963, p.112. ↑ Cf. Natias Neutert: Foolnotes, Soho, New York 1980, p.7. ↑ Cf. Christoph Hollender: Der Diskurs von Poesie und Religion in der Eichendorff-Literatur. In: Wilhelm Gössmann (Ed. ): Joseph von Eichendorff. Seine literarische und kulturelle Bedeutung. Paderborn/Munich/Wien/Zurich 1995, p.163-232. ↑ Quoted after Robert König: Deutsche Literaturgeschichte. 18th edition. Verlag Velhagen & Klasing, Bielefeld/Leipzig 1886, p.521. ↑ Cf. Theodor W. Adorno: Zum Gedächtnis Eichendorffs. In: Noten zur Literatur I, No.47, Frankfurt am Main, 1963, p.119. ↑ This collection was supported by Adolf Schöll, a classic philologist and literary historian, whom the poet had met in 1832 in Berlin.- Cf. Harry Fröhlich (Ed. ): Zur Edition. In: Joseph von Eichendorff: Sämtliche Werke des Freiherrn Joseph von Eichendorff. Historisch-kritische Ausgabe, begründet von Wilhelm Kosch/August Sauer. 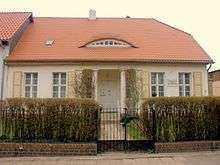 Fortgeführt von Herrmann Kunisch/Helmut Koopmann. Bd. I. Stuttgart/Berlin/Köln 1994, p. 11. ↑ Cf. Hans Jürg Lüthi: Dichtung und Dichter bei Joseph von Eichendorff. Francke Verlag, B.ern 1966, 307-308. 1 2 Cf. Hans Jürg Lüthi: Dichtung und Dichter bei Joseph von Eichendorff. Francke Verlag, Bern 1966, p. 307-308.